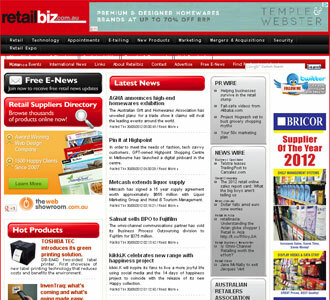 Reporting on Australia’s $292 billion retail sector, RetailBiz is updated daily to provide access to breaking news, conference information, employment opportunities and domestic and international news feeds. Independent and authoritative, RetailBiz provides a range of news, education and opinion with an emphasis on research and analysis in articles that challenge current ideas and encourage innovative thinking. Industry personnel are kept well informed with changes to their industry with a free e-newsletter sent three times a week- subscribe. RetailBiz has the largest team of retail journalists who collectively cover over 13 separate retail verticals and focus on original news stories and research – not just press releases.